In our days the success of a firm depends from the accurate and wide-ranging information and form the conntact with the clients. In these can be helpful for you this multifunctional multimedia kiosk, which was invented by our engineers. 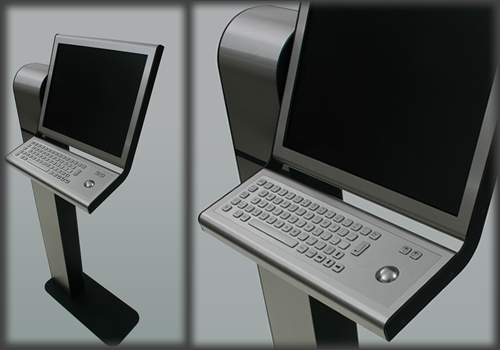 Our kiosk can be equipped with a complete PC or just with an LCD display. In the latter case there is a possibility to inform and/or to entertain the public at large but the information will be only single-lined. If you choose the kiosk with the built in PC, then out of the information and the entertainment of your clients they will be able to get in touch with your firm through this terminal. You can connect to this terminal a webcam, a phone, a card reader, printer or anything what you can connect to a normal PC... and we can invent some special equipments to this terminal if there is a need for this. The kiosk which we offer can be used to popularize your web page, for accessing an online database, for liquidation of business transactions, for internet surfing, for videophone calls...etc. The usage of it depends only from your ideas. Reliability, durability and a wide-ranging use was kept before eyes by our engineers, while by our designers the elegance and the fitting forms for the daily usage. So our kiosk can be placed anywhere: on airports,in schools, museums, in shopping centres, banks or even outdoor, or on trains too!